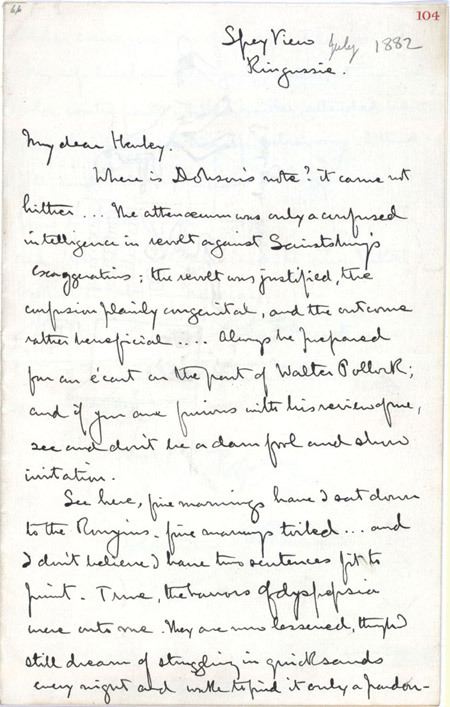 Letter to W E Henley. National Library reference: Adv.MS.26.8.2, ff.104, 244. Robert Louis Stevenson's letters to W E Henley are a group of revealing and intimate letters that give a unique insight into the lives of both men. Henley was a poet, playwright and author. He went to Edinburgh for treatment of tuberculosis by Joseph Lister, and he and Stevenson and began a friendship that lasted for many years. Despite the trials that both men faced, their letters are full of impudence and private jokes, and Stevenson often illustrated them.